The cost your children's education can be expensive but you can make savings along the way. Check out our A-Z for money saving tips that could help reduce the cost of your child's education. As a parent, you want to give your children the best possible start in life, but the cost of education can really add up over their educational lifetime. From books and uniforms to fees and equipment, the initial annual expenditure when kids go back to school can be substantial. Often there are many other costs throughout the academic year, so it's more important than ever to plan and budget for how you are going to cover these ongoing costs and to make savings wherever you can. 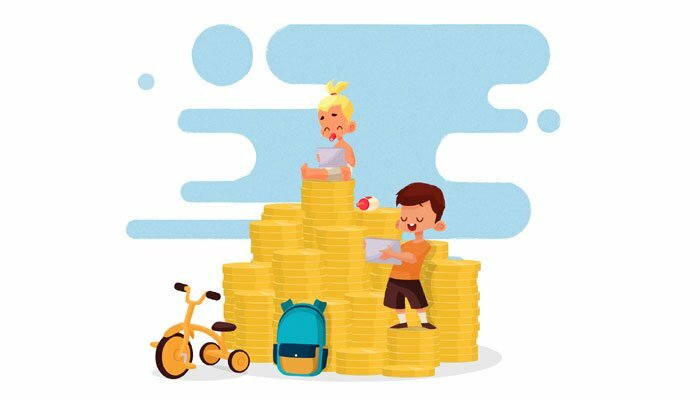 The average annual cost of sending a child to primary school each year is €473, and for a child entering secondary school, that figure goes up to €1,040 per annum. Knowing what the annual cost for sending a child to school is will help when planning your savings and finances. Buying books each year, especially if you have more than one child, can be expensive. There are plenty of ways to bring down the cost of purchasing books. These include buying second hand and sharing with siblings or friends who have children of a similar school-going age. Libraries can be a valuable resource too. Rather than parents driving their own children in individual cars, wouldn't it make sense to come to an arrangement with other parents whereby you take it in turn to carpool? Not only will it reduce fuel costs but it is also better for the environment and will help reduce traffic volumes. Kid can be busy little people, and keeping track of all their comings and goings, and indeed the cost of their many adventures, can be difficult. Keeping a diary is a good way of earmarking when special occasion such as parties or school trips are coming up. Pre-empting events will help you prepare in advance rather than panic buying at the last minute. Kids are into the latest sport one week only to ditch it for something else the following week. Rather than splashing out on sports gear each time they show the slightest interest in a particular sport, why not borrow the equipment first? This way you can see if they are going to stick with it before you invest in any expensive kit. Investing in a good quality flask for your kids to bring hot drinks or soups to school, especially during the winter months, will save you having to give them money to buy hot food in the school canteen. If they have specific dietary requirements or preferences, you can probably cater for them better than the school canteen will, so not only will you be saving money but your children will enjoy their lunches all the more. Pre-school and national school-attending children that are referred to from either the child or school health services who require optical care, can access treatment free of charge. Children that require these services can do so until they have reached the age of 16. In terms of design, free glasses have come a long way in recent years, so children have much more choice available to them. Before you child starts school, it's a good idea to do your homework on schools in your area, the fees involved in sending your child to these schools and the logistics of getting to and from the school. Having all this information can help make your mind up about the school that best suits your child and your budget. Have you considered investing money in a savings account where you could earn interest? The cost of sending your children to primary, secondary and then third level education can add up to a considerable expense, which Zurich estimates is in the region of €40,000 per child over their educational lifetime. It therefore makes sense to plan how you will provide for their education financially, and opening a savings account that will grow through interest, is an option worth considering. Making your own freshly squeezed juice is not only better for your child's health but will be better for your wallet too. Buying fresh seasonal fruit and vegetables in bulk and juicing them yourself will be less expensive than buying ready-made juices, plus the kids can create their own personal flavours. Keep an eye out throughout the year for low cost school items such as uniforms and shoes. Buying items such as these when they are on sale, perhaps later in the year when the back to school frenzy has died down, can save you a considerable amount of money over the long-term. It's a really good idea to label your child's uniform and sportswear. Often children lose or misplace jumpers and jackets and footing the bill to replace these items can be an unnecessary expense. At least if the clothes are labelled, there is some chance of them being returned to their rightful owner. If your child has a medical condition or needs regular medicine, the Long Term Illness Scheme covers the cost of drugs and medical or surgical appliances for the treatment of certain conditions. Because the scheme is not dependant on your income, it can be a lifeline for parents of children with an ongoing illness. If you buy notepads, pens, markers and other stationary in bulk you can make substantial savings. There are some great deals online for bulk purchases, but just make sure to check the postage or shipping fees to ensure it's not costing you more to get the items delivered. Enjoying the great outdoors doesn't have to cost a penny and is a great way for all the family to get together. Whether it's a winter forest walking, a sunny day at the beach, or a springtime stroll in the countryside, at any time of the year the great outdoors is there waiting to be explored. No matter what age your child is, ensuring they bring a packed lunch to school or college each day will reduce the cost considerably. There are endless interesting ways you can make a packed lunch wholesome and tasty, and not only will you save money but you're more likely to be able to provide a healthier option than shop bought lunches. It can be tempting to buy the cheapest school bag, but it might not make economic sense halfway through the school year when it has a hole in it or the straps are hanging off. Buying a good quality school bag that will last at least a year, if not more, will be a good investment in the long run. Just because something is old, doesn't mean it's for the bin. YouTube videos and online tutorials are a great source of inspiration when it comes to upcycling. Finding new uses for something that has served its original purpose is a great way of repurposing something, it's good for the environment and it can be a fun activity for all the family to get involved in. It can be difficult to save on shoes as you can't buy bigger sizes and wait for them to grow into them. You can however buying non-branded footwear which will help reduce the cost to some extent. If shoes are still in good condition they can be passed down to siblings too. Public transport can add up and can also go up without much warning. However, there are ways to budget for the cost of transport. An obvious one is ensuring your child has a Student Leap Card, which saves around 20% on journeys as opposed to paying in cash. Because you top up the card yourself, you can also have more control over when you top up the card and by how much. When shopping for school uniforms, consider buying a size or two up so that the kids get more than a year out of them. Another cost saving tip when it comes to school uniforms is to purchase the school crest and iron them onto standard jumpers and tracksuits. The voluntary contribution is an annual payment made to schools, usually, though not always at the start of the school year. If you have a lot of outgoings when the academic year begins it might be worth checking with the school to see if you can postpone payment until later in the year. Alternatively as you know it's an annual fee, why not plan ahead and budget in advance for the voluntary contribution. If it's possible to walk the kids to school this is a bonus because it generally means you live within close proximity to the school. Not only will it save you money on transport but it's also a good form of exercise. It's a good idea to invest in high visibility clothing so that the children are visible, especially during the winter months. Xaero is a Minimap option in Minecraft, the video game that has really captured the minds and imaginations of adults and children alike. Minecraft enables users to construct things out of textured cubes. It has been hailed as the 21st century version of Lego, and if your kids are going to have screen time, this might not be the worst way to spend it. Organising a yard sale and be great fun and a way of de-cluttering the house. Involve the kids by getting them to sell their old toys. Although they might not make a fortune, it will teach them the value of money and anything they earn can be used to buy something new that they want. Zurich offers a number of savings and investment plans specifically tailored to parents who wish to save for their children's education. Planning early for your children's education allows you to spread the cost over a longer period. Plus, you can choose savings options that may bring higher growth potential. Want to give your savings a big kick-start? The cost of sending your children to primary, secondary and then third level education can be expensive, especially over a number of years and if you have more than one child. But there are things you can do to prepare financially for your little ones' futures. Our budget calculator will help you get to grips with your monthly income and expenses and will help you see where savings can be made. In addition, our excel budget template will help you plan and manage your money more effectively.